Is it safe on the strings? What if there're three? I've recently moved to living in a new place, something like a flat or apartment, and apparently I can't play the violin anymore because it is too loud, even in the middle of the day. 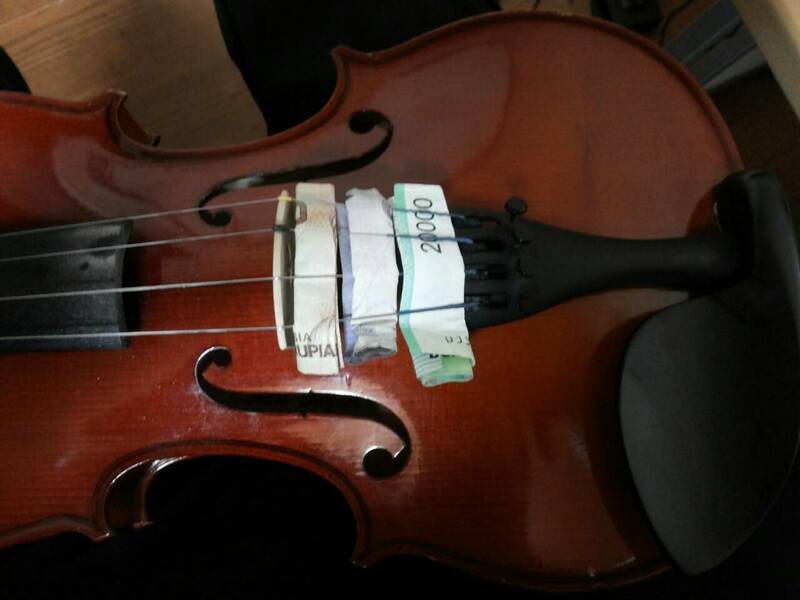 So I searched the internet about violin mutes, and I found the "dollar bill mute" thing and tried it (though not with dollar), but apparently 1 didn't mute the violin enough, so I had to use 3 sheets. It worked well. But I'm kind of worried for the strings. Does it damage the strings if I put on all those mutes? If so, to what extent? Do I have to remove the mutes when done playing and putting away the violin, or can I keep them (meaning they really don't damage the strings)? What dampens the sound the most is to reduce vibrations on the bridge and or top of the violin. Obviously the bills dampen vibrations a bit but try pushing them tight up against the bridge. You've probably heard of putting a clothespin on the bridge as well right? Yes, I've read about using a clothespin and it seems like a nice way, according to what I read. However I don't have a clothespin yet and don't know where to get it yet (there's language barrier for finding it too) so it's not an option yet. Using so many bills work surprisingly well however, so this is the one I'm going to use unless it's harmful on the strings. I didn't know that it's the bridge I mostly have to reduce vibrations on, so it's a useful information.